on several thousands of kilometers by the hurricanes. How can you see the atmosphere? By tracking what is carried on the wind. The answer is blowing in the wind. Tiny particles, known as aerosols, are carried by winds around the globe. This visualization uses data from NASA satellites combined with our knowledge of physics and meteorology to track three aerosols: dust, smoke, and sea salt. Sea salt, shown here in blue, is picked up by winds passing over the ocean. As tropical storms and hurricanes form, the salt particles are concentrated into the spiraling shape we all recognize. With their movements, we can follow the formation of Hurricane Irma and see the dust from the Sahara, shown in tan, get washed out of the storm center by the rain. This visualization uses data from NASA satellites, combined with mathematical models in a computer simulation allow scientists to study the physical processes in our atmosphere. Advances in computing speed allow scientists to include more details of these physical processes in their simulations of how the aerosols interact with the storm systems. The increased resolution of the computer simulation is apparent in fine details like the hurricane bands spiraling counter-clockwise. Computer simulations let us see how different processes fit together and evolve as a system. By using mathematical models to represent nature we can separate the system into component parts and better understand the underlying physics of each. Today's research improves next year's weather forecasting ability. Hurricane Ophelia was very unusual. It headed northeast, pulling in Saharan dust and smoke from wildfires in Portugal, carrying both to Ireland and the UK. This aerosol interaction was very different from other storms of the season. As computing speed continues to increase, scientists will be able to bring more scientific details into the simulations, giving us a deeper understanding of our home planet. Tiny aerosol particles such as smoke, dust, and sea salt are transported across the globe, making visible weather patterns and other normally invisible physical processes. By following the sea salt that is evaporated from the ocean, you can see the storms of the 2017 hurricane season. During the same time, large fires in the Pacific Northwest released smoke into the atmosphere. Large weather patterns can transport these particles long distances: in early September, you can see a line of smoke from Oregon and Washington, down the Great Plains, through the South, and across the Atlantic to England. Dust from the Sahara is also caught in storms sytems and moved from Africa to the Americas. Unlike the sea salt, however, the dust is removed from the center of the storm. The dust particles are absorbed by cloud droplets and then washed out as it rains. 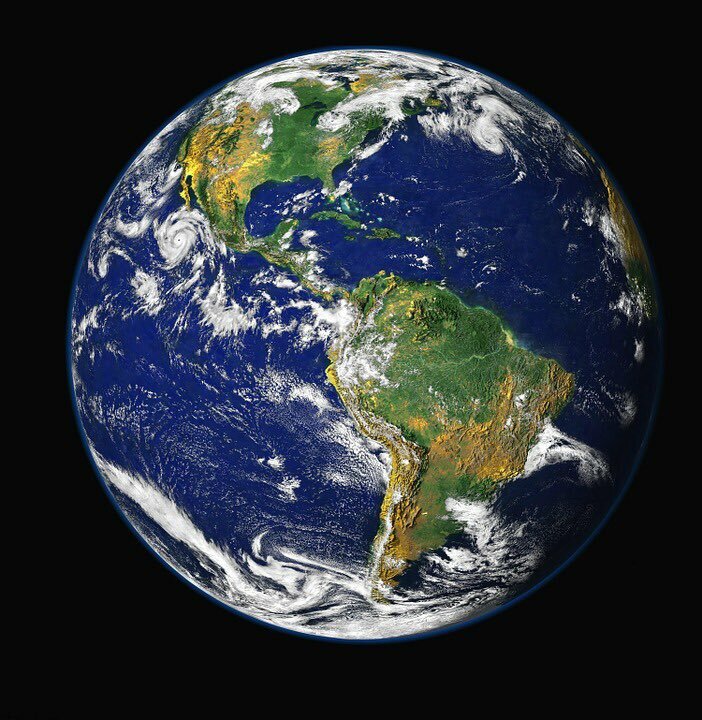 Since the fall of 1997, NASA satellites have continuously observed all plant life at the surface of the land and ocean. This view of life from space is furthering knowledge of our home planet, and how it's changing. In the Northern Hemisphere, ecosystems wake in the spring, taking in carbon dioxide and exhaling oxygen as they sprout leaves – and a fleet of Earth-observing satellites track the spread of vegetation. Meanwhile, in the ocean, microscopic plants drift through sunlit surface waters blooming into billions of carbon-dioxide-absorbing, oxygen-producing organisms – and satellites map the swirls of their color. It's the one thing that, so far, makes Earth unique among the thousands of other planets we’ve discovered. Can an autonomous sailboat cross the Atlantic ? Sailing a boat across the Atlantic is challenging enough for a human sailor. But what about a computer? BBC Future visits a sailing regatta for robots. No one has ever sailed an autonomous boat across the Atlantic. Few have even tried – just a handful of teams have competed in the transatlantic Microtransat Challenge since it began in 2010. All have failed, for reasons including “caught in a fishing net”, “picked up by a fishing boat” or, frequently, simply lost at sea with a vague last-known location. The closest anyone has ever come was the summer of 2017, when a boat called Sailbuoy, built by a company called Offshore Sensing, travelled 1,500 kilometers – more than half way – before it started going in circles. Officially, the winner of the Microtransat is the fastest team to achieve the crossing; in reality, the winner is the first. They have set rules, like a maximum vessel length (2.4m or 8ft) and an obstacle/collision avoidance system. But teams can just launch their boat anytime between July and December, and it doesn’t even matter what direction they go – Newfoundland to Ireland, or vice versa. Competitors include university clubs, but also autonomous vessel companies like Offshore Sensing (a company that makes sail-powered autonomous research vessels), and even the US Naval Academy. The main goal is just finishing, after all. “It’s just a really challenging environment,” says David Peddie, CEO of Offshore Sensing. Sailbuoy has a bit of an advantage. It’s a commercial company that sells similar boats for applications in oceanography and meteorology research. The vessel it sent on the Microtransat had previously completed several months of autonomous sailing in the rougher North Sea without any problems. From the top, the boat looks a little like a surfboard, with a solar panel in the middle, and a short, trapezoidal sail near the front. Aside from the sail, it sits low in the water, cutting through with a tapered nose and tail. Rough seas toss it about, even washing over the top, without damaging it, and it seems, almost miraculously, to keep a steady course. Others have eyes on the challenge, too, and new ideas on how to solve it. At the Aland University of Applied Sciences, a small team of engineers has been building robotic sailboats and entering them in competitions since 2013. This year, they bought a 2.8m (9.2ft) rigid “wing” type sail – the kind of symmetric airfoil you might see on World Cup sailboats – from a Swedish aircraft manufacturer and mounted it on their 2.4m (8ft) sailboat, ASPire. ASP stands for Autonomous Sailing Platform, and it’s white like Sailbuoy, but with a deeper, narrower hull and the tall, rectangular wing sail, flanked with two smaller airfoils. Both rigs were built not to compete in a race, but to act as research tools, carrying water sensors to measure pH, temperature, conductivity, and salinity. Despite the focus on research, the risks of using the new and unproven wing sail, and an untested system, Aland Sailing Robots entered its vessel in September’s World Robotic Sailing Championships, held in Horten, Norway – and won. The World Robotic Sailing Championships is a spin-off of the Microtransat in which teams from universities or companies in related fields compete over four days in different tasks, including a fleet race, an area-scanning competition, collision avoidance, and station keeping, where the boat must hold its position for five minutes. On a windy first day along Norway’s Oslofjord inlet, a staggered-start race saw ASPire launch shortly after a boat from Norway. As the boats headed out into Horten’s inner harbour, a bay next to a shipyard with Sweden visible across the water, the team from Aland watched their boat slowly catch, then pass the leading boat. “That was good to see,” says Anna Friebe, project manager for Aland Sailing Robots. “I didn’t really think we would be able to compete. While the team’s strength is in software engineering and situational analysis, they still have to be adept enough at mechanical engineering to make the boat operate in the challenging seas. ASPire was built on a hull with stabilising lead weights in the keel that was used in a paralympic sailing competition. To this, in addition to the wing sail, the team mounted the research sensors and built a rig to winch those down into the water. The boats at the World Robotic Sailing Championships vary in size and shape, from the futuristic-looking ASPire to a small, traditional two-sailed sloop that looks like the kind of remote-control sailboat a kid might sail on a pond. On the second day of the competition, the fjord was shrouded in rain as the boats used the wind, the angle of their sails, and their rudders, to sit precisely in position without moving. Like all the competitions, an onboard computer, programmed ahead of time, had to be capable of recognising the wind conditions, understanding its own location, and manipulating the sail and rudder to compensate. This too, Aland won, ahead of second-place hosts University College of Southeast Norway and US Naval Academy in third place. 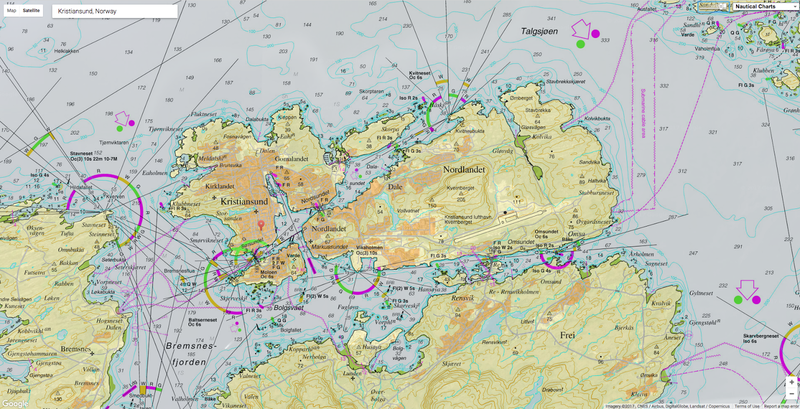 Day three featured area scanning, where boats had 30 minutes to cover as much of a designated area as possible. Most used a traditional tacking manoeuvre to trace a path, playing out line to open the sail, or reeling it in to change the angle. ASPire’s wing sail instead rotated around a central mast, which Friebe says simplified the operations. Seen from overhead, ASPire’s path looks like a lawn-mower grid, compared to other boat’s piles of spaghetti, and so Aland made a full sweep, as day four’s collision avoidance event was cancelled due to a lack of sufficient wind. Aland Sailing Robots was formed to compete in the Microtransat, but financial pressure – most of their funding comes from the European Regional Development Fund and goes toward the marine research platform – means they haven’t had the resources to make an attempt at the crossing. The fun of competition and the long-term quest to cross the Atlantic are, for many of the participants, byproducts of business or research projects. The aim of the Microtransat, according to organiser Colin Sauze, is to contribute to ocean-monitoring platforms, but also to provide a learning opportunity. Both Aland and Offshore Sensing are focusing primarily on aquatic research. Robots offer several big advantages over the other means of acquiring ocean data, says Peddie. The other options – a drifting buoy, or a manned vessel – are less mobile or more expensive. A traditional research vessel can cost $20,000 (£15,180) per day, which Peddie says could run an autonomous sailboat for several months, including the cost of the boat. Furthermore, small boats (Sailbuoy is two metres long and weighs 60kg (200lbs)) can go places manned boats can’t, like the path of a hurricane, or volcanic or iceberg fields. Many of the other teams, both in the Microtransat and the World Robotic Sailing Championships, are either run by industry, or partnered with industry. The US Naval Academy team uses it as education for naval personnel (their boat, Trawler Bait, has been caught by fishermen more than once). Half of the Chinese team is from Shanghai University, and the other half is from a company. The Norwegian naval research institute sent an autonomous boat to help with the event. And a lot of what they work on can be applied even beyond sailing vessels. Autonomous shipping is already burgeoning, and the standards Microtransat competitors must meet for collision avoidance are the same ones put out by the International Maritime Organisation, and the automatic identification system that the Aland team used to transmit and receive course and speed to other vessels is the same one that commercial ships use. “For us, as a company, it wasn’t a really big deal, the actual Microtransat,” says Peddie. “But I’ve been following these guys for a number of years, and I think it’s an interesting concept. Still, Peddie plans to try again next year, once the Sailbuoy, which was picked up by a fishing vessel, is returned and fixed (they still don’t know quite what’s wrong with it). “We’d just like to be the first ones who do it, and manage to cross this part of the ocean,” he says. NOAA’s Office of Coast Survey released the National Charting Plan following a public comment period that ended in July 2017. A draft version of the plan was released in February 2017. 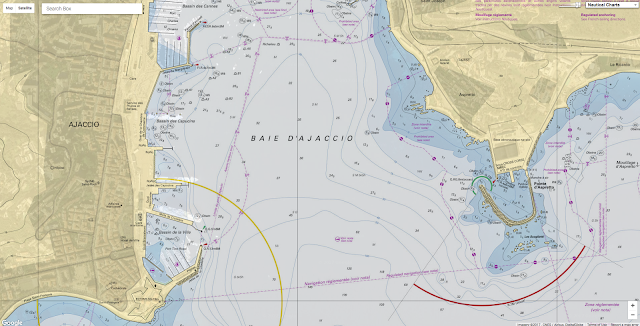 The final version reflects the feedback received from professional mariners, recreational boaters, print-on-demand chart publishers, third-party data providers, software developers, and other users of NOAA charts. The National Charting Plan is a strategy to improve NOAA nautical chart coverage, products, and distribution. 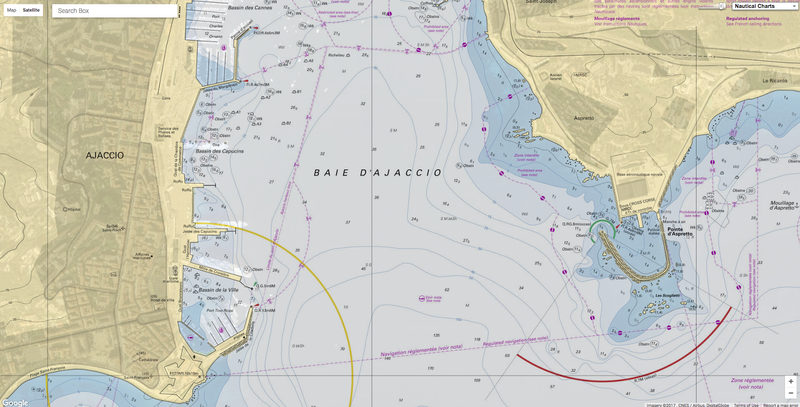 It describes the evolving state of marine navigation and nautical chart production, and outlines actions that will provide the customer with a suite of products that are more useful, up-to-date, and safer to navigate with. It is not a plan for the maintenance of individual charts, but a strategy to improve all charts. Much of the content of the original draft remains unchanged, but several topics were added or clarified. 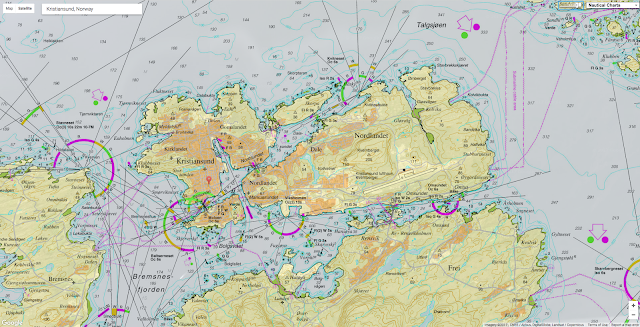 Provides a more nuanced discussion of future production of raster and paper nautical charts. 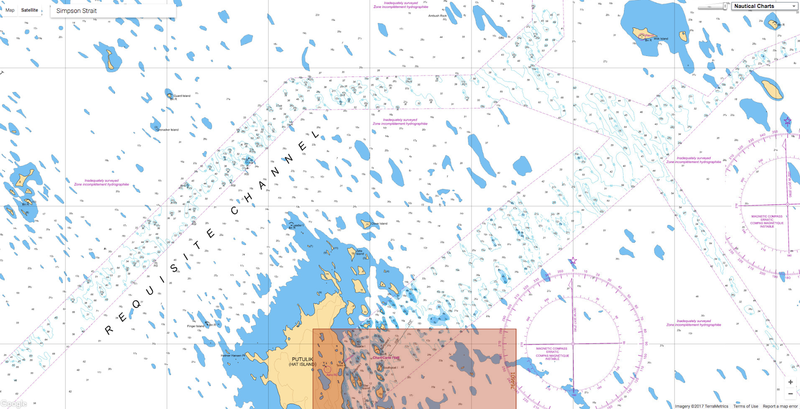 NOAA has no current plans to stop the production of paper or raster nautical charts. However, raster charts may look a bit different in the future. Includes an acknowledgement of the role played by third-party providers of information based on NOAA raster chart products. Includes an acknowledgement of the growing amount of source data that is coming from non-traditional or “crowd-source” data providers. Coast survey received fewer than twenty comments regarding the possible conversion of depths from fathoms and feet to meters. These came from both recreational boaters and professional mariners. The majority of the comments favored retaining the standard U.S. units of fathoms and feet. Coast survey is proceeding to make ENCs more compatible with metric units (The international product specification for ENC mandates that depths must be encoded in meters). However, raster charts will continue to show depths in fathoms and feet. 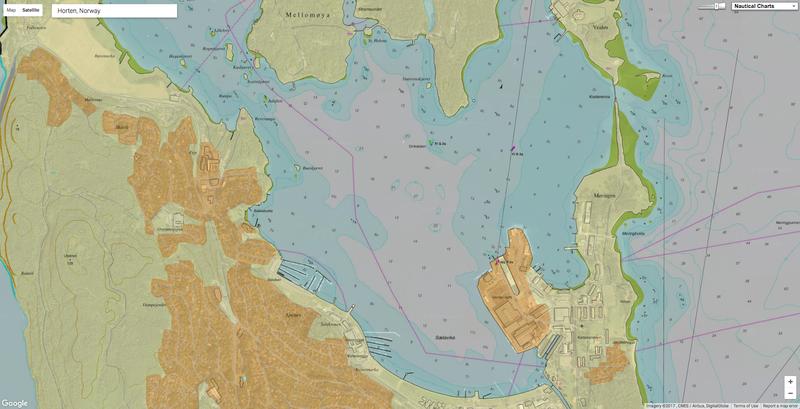 Coast Survey is prototyping some options that would allow users to create customized raster charts by selecting the chart size and scale, as well as the units used to display depths. In partnership with the U.S. Army Corps of Engineers, Coast Survey will continue to explore ways to improve the consistent, up-to-date provision of depth information in channels maintained by the Corps. This will likely change the way channel depths are portrayed on charts. Includes a section describing Coast Survey’s support to the U.S. Baseline Committee and the charting of important maritime boundaries. You may ask a question or report a problem with any of Coast Survey’s products or services through the NOAA Nautical Inquiry and Comment System. 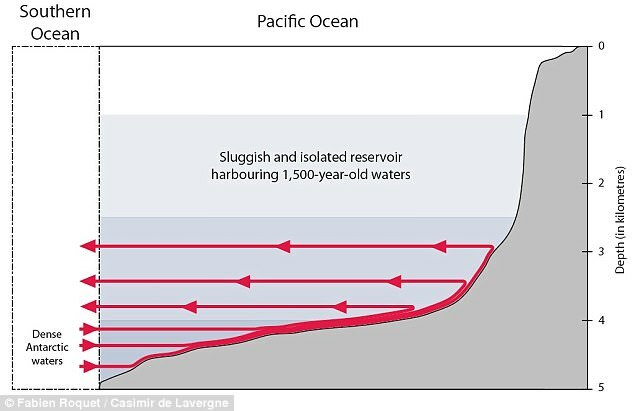 In the North Pacific, way below the surface, hangs water that hasn't seen the sun in a millennium. A mysterious patch of water in the Pacific Ocean hasn't touched the surface since the fall of the Roman empire. Experts used computer modelling of deep sea currents to reveal the reason why the vast 'shadow zone' has remained near stagnant for around 1,500 years. They found that it sits in between layers of water with currents driven by heat from the Earth below and whipped up by wind above. The unique shape of the ocean floor means that upwards currents don’t reach high enough to push the layer upwards, leaving it in a no man’s land between the two. A mysterious patch of water in the Pacific Ocean hasn't touch the surface since the fall of the Roman empire. An international team of researchers, including the University of New South Wales (UNSW) and Stockholm University, studied the strange region, between 0.6 and 1.5 miles (one and 2.5 km) down. 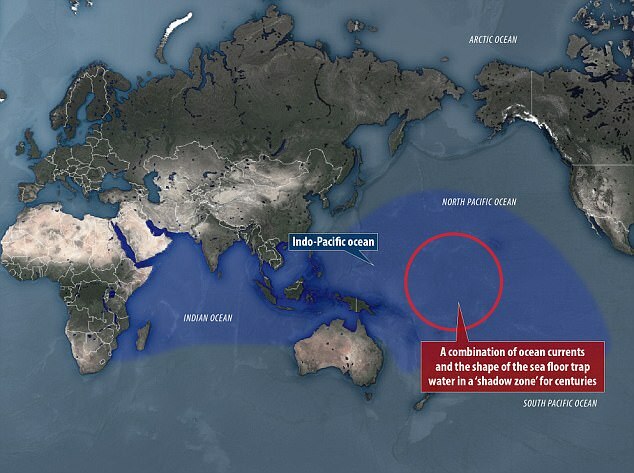 It covers an area 3,700 by 1,250 miles (6,000 by 2,000 km), where the North Pacific meets the Indian Ocean. Carbon dating has previously been used to identify its age and location, but scientists didn't understand what caused it to form. By including the shape of the ocean floor in their simulation, the team was able to measure its impact on the movement of currents. They found that water at the bottom of the ocean, heated by geothermal energy deep within the planet, was unable to rise above 1.5 miles (2.5km) below the surface. Instead of travelling upwards, currents loop back on themselves horizontally, leaving the layer directly above untouched. 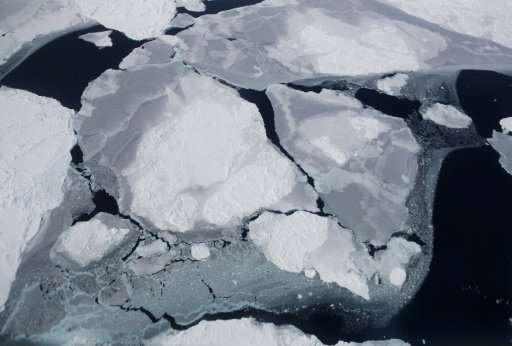 Dr Casimir de Lavergne, lead author from UNSW, said: 'Carbon-14 dating had already told us the most ancient water lied in the deep North Pacific. 'But until now we had struggled to understand why the very oldest waters huddle around the depth of 1.2 miles (2km). While the researchers have unlocked one part of the puzzle, their results also have the potential to tell us much more. The lack of contact with the ocean's surface means oxygenation of the zone is very low. That means marine life is restricted, but not completely absent. It is hoped that the research could help scientists better understand the capacity of the oceans to absorb heat trapped by rising greenhouse gases. 'When this isolated shadow zone traps millennia old ocean water it also traps nutrients and carbon,' added fellow author from Stockholm University, Dr Fabien Roquet. The full findings of the study were published in the journal Nature. This is the best map yet produced of the warmth coming up from the rocks underneath the Antarctic ice sheet. Measurements suggest a hot plume of mantle rock below West Antarctica. This "geothermal heat flux" is key data required by scientists in order to model how the White Continent is going to react to climate change. If the rock bed's temperature is raised, it makes it easier for the ice above to move. And if global warming is already forcing change on the ice sheet, a higher flux could accelerate matters. The map was made by researchers at the British Antarctic survey and is published in the journal Geophysical Research Letters. "The heat coming from the Earth’s interior is important to understand the overall conditions that control the dynamics at the base of the ice sheet and hence the ice flow,” explained Yasmina Martos, currently affiliated to the US space agency. "If this heat flux is elevated, the ice base can melt and produce water that acts as a sliding film. 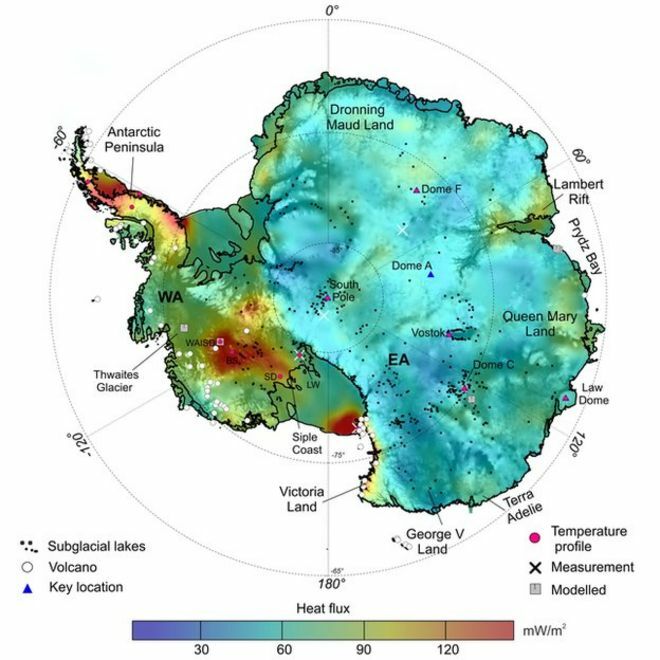 "One result of our study is that the heat flux is higher underneath West Antarctica, where more ice is currently melting, than underneath East Antarctica. "Even a little melting at the base helps the ice sheet to slide faster. We also identified areas of low heat flux, which will help stabilising the ice sheet," she told BBC News. 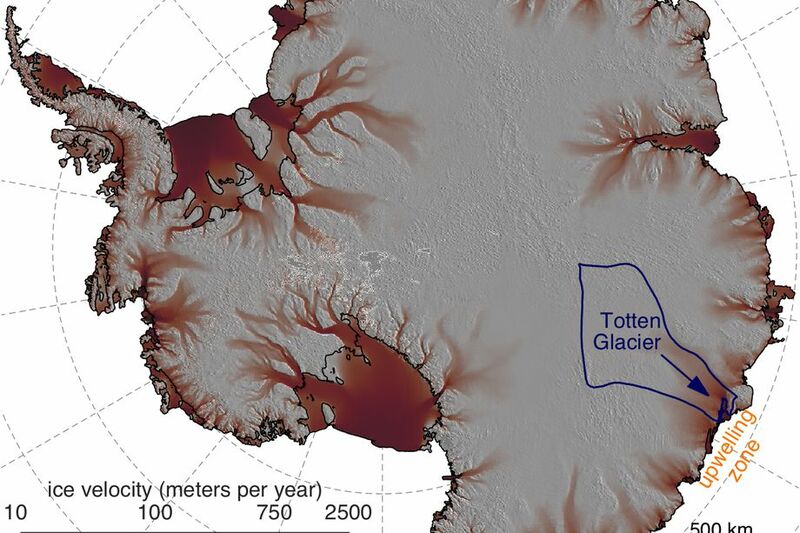 A map of Antarctica shows where Totten Glacier is. No-one has actually drilled through the kilometres of ice in Antarctica to take the temperature of the bed. Instead, the BAS team inferred the likely warmth of rocks from their magnetism. This property can be sensed by instruments flown across the surface of the ice sheet by planes. What happens next is a smart calculation. Scientists know the temperature (580C) at which hot minerals lose their magnetism, so if they can gauge how close to the rock-ice interface this occurring then they have a means of estimating the heat flux. The new map is said to represent a 30-50% improvement on previous efforts. Surface wind causes warm water to upwell at the continental shelf break, the warm water melts Totten Ice Shelf from below, and the glacier responds by speeding up. It supports - but with far more detail - the established idea that East and West Antarctica are very different provinces. The East is a giant chunk of old, cold continental crust. The West, however, underwent recent rifting in the Cretaceous (100 million years ago) that has pulled it apart. "This rifting has thinned the crust and brought hot material from deep down in the Earth - from hundreds of km down - to within 100km or so, or even maybe less, of the rock surface," said co-author Tom Jordan. "It confirms what you would expect from the sparse, exposed geology in West Antarctica where we have volcanoes." One of the great advances in polar science in the past decade is the recognition that there is a really extensive hydrological network under the ice sheet. Rivers of water feed huge subglacial lakes that fill and burst their banks periodically. Satellites see the top of the ice sheet heave and relax when this happens. 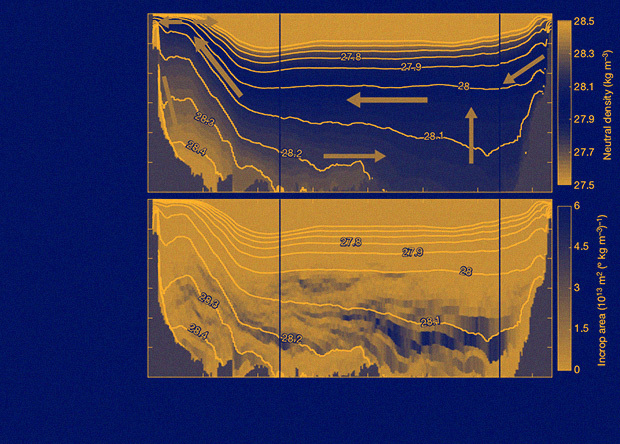 Illustration of flowing water under the Antarctic ice sheet. Blue dots indicate lakes, lines show rivers. Marie Byrd Land is part of the bulging "elbow" leading to the Antarctic Peninsula, left center. Any projections of future change in Antarctica and its contribution to sea level rise through the loss of ice have to take this basement hydrology into account, and the variations in geothermal heat flux are a critical part of the overall picture. One research project that will see an immediate benefit from the map’s data is the quest to drill the oldest ice on the continent. Europe, America, China and others are seeking a location where they can collect a core of frozen material that contains a record of past climate stretching back at least 1.5 million years. This information - about historic atmospheric conditions including carbon dioxide levels - can be deciphered from tiny air bubbles trapped in the ice. Map of antarctic ice flow speeds (2011). But the whole endeavour depends on the base of the ice sheet being undisturbed. Places with a warm rock underbelly are therefore to be avoided, obviously. 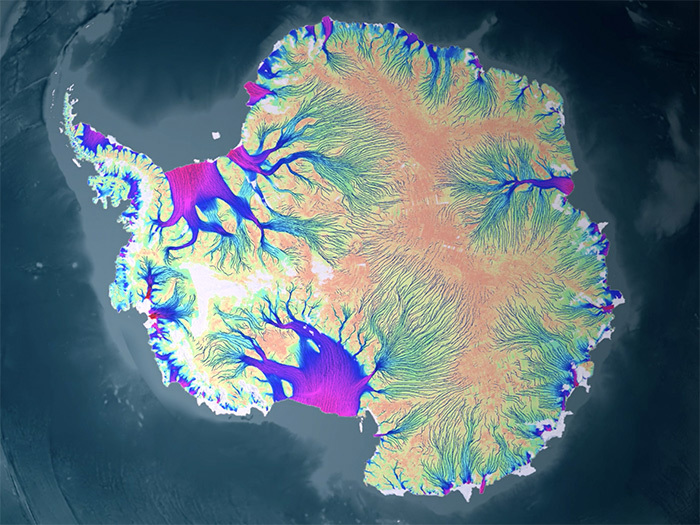 "It is very exciting to see the implications this new heat map has for many communities, including new generations of ice sheet and sea level models," said Dr Martos. "I am very glad we are contributing an important aspect at unprecedented detail. The Earth’s interior has a lot to tell us in terms on how the ice behaves." who issue second warning to humanity on catastrophic climate change. Carbon dioxide emissions are set to rise this year after a three-year pause, scientists said at UN climate talks Monday, warning that "time is running out", even as White House officials used the occasion to champion the fossil fuels that drive global warming. CO2 emissions, flat since 2014, were forecast to rise two percent in 2017, dashing hopes they had peaked, scientists reported at 12-day negotiations in the German city of Bonn ending Friday. "The news that emissions are rising after a three-year hiatus is a giant leap backward for humankind," said Amy Luers, a climate policy advisor to Barack Obama and executive director of Future Earth, which co-sponsored the research. Global CO2 emissions for 2017 were estimated at a record 41 billion tonnes. "Time is running out on our ability to keep warming below two degrees Celsius (3.6 degrees Fahrenheit), let alone 1.5 C," said lead author Corinne Le Quere, director of the Tyndall Centre for Climate Change Research at the University of East Anglia. In 1992, scientists warned that humans had to change or the Earth would become unlivable. What's changed 25 years later? The 196-nation Paris Agreement, adopted in 2015, calls for capping global warming at 2 C below pre-industrial levels. With the planet out of kilter after only one degree of warming—enough to amplify deadly heatwaves, droughts, and superstorms—the treaty also vows to explore the feasibility of holding the line at 1.5 C.
"As each year ticks by, the chances of avoiding 2 C of warming continue to diminish," said co-author Glen Peters, research director at Center for International Climate Research in Oslo, Norway. "Given that 2 C is extremely unlikely based on current progress, then 1.5 C is a distant dream," he told AFP. The study identified China as the single largest cause of resurgent fossil fuel emissions in 2017, with the country's coal, oil and natural gas use up three, five and 12 percent, respectively. Earth is overheating due to the burning of oil, gas and especially coal to power the global economy. That did not discourage US officials from the administration of President Donald Trump from making a case at the UN negotiations for "The Role of Cleaner and More Efficient Fossil Fuels and Nuclear Power in Climate Mitigation." "Without a question, fossil fuels will continue to be used," George David Banks, a special energy and environment assistant to the US president told a standing-room only audience, citing projections from the International Energy Agency (IEA). Faced with this reality, "we would argue that it's in the global interest to make sure that when fossil fuels are used, that it's as clean and efficient as possible." Flanked by Francis Brooke from the office of Vice President Mike Pence, and senior representatives of American energy companies, Banks addressed a packed room where protesters shouted "you're liars!" and "there's no clean coal!". Former New York mayor Michael Bloomberg, UN special envoy for cities and climate change, tweeted: "Promoting coal at a climate summit is like promoting tobacco at a cancer summit." The US is the only country in the world that has opted to remain outside the Paris Agreement. More than 15,000 scientists meanwhile warned that carbon emissions, human population growth, and consumption-driven lifestyles were poisoning the planet and depleting its resources. "We are jeopardising our future," they wrote in a comment entitled "World Scientists' Warning to Humanity: A Second Notice," echoing a similar open letter from 1992. It is "especially troubling" that the world continues on a path toward "potentially catastrophic climate change due to rising greenhouse gases from burning fossil fuels," they said. "We have unleashed a mass extinction event, the sixth in roughly 540 million years." Another group of scientists cautioned that rising global temperatures were bringing Earth ever closer to dangerous thresholds that could accelerate global warming beyond our capacity to rein it in. "In the last two years, evidence has accumulated that we are now on a collision course with tipping points in the Earth system," Johan Rockstrom, executive director of the Stockholm Resilience Centre. Some scientists, for example, have concluded that the planet's surface has already warmed enough—1.1 degrees Celsius (2.0 degrees Fahrenheit) on average—in the last 150 years to lock in the disintegration of the West Antarctic ice sheet, which holds enough frozen water to lift global oceans by six or seven metres. It may take 1,000 years, but—if they are right—the ice sheet will melt no matter how quickly humanity draws down the greenhouse gases that continue to drive global warming. It's the one thing that, so far, makes Earth unique among the thousands of other planets we've discovered. Since the fall of 1997, NASA satellites have continuously and globally observed all plant life at the surface of the land and ocean. Rockstrom and colleagues identified a dozen such natural processes that could tip into abrupt and irreversible change. An increase of 1-3 C, for example, would likely provoke the loss of Arctic summer sea ice, warm-water coral reefs, and mountain glaciers. A degree or two more would see large swathes of the Amazon rainforest turn into savanna, and slow a deep-sea current that regulates weather on both sides of the northern Atlantic. The International Union for Conservation of Nature (IUCN), meanwhile, released a report Monday showing that climate change now imperils one in four natural World Heritage sites, including coral reefs, glaciers, and wetlands—nearly double the number from just three years ago. NYTimes : The stakes in the Paris Climate Deal : What might other countries do ? Autonomous ships are almost here. What is going to be their impact in shipping ? Unmanned marine vehicles will use sensors & AI to crisscross the world’s oceans without a crew – potentially lowering costs & improving safety for the $334B shipping sector. Just as driverless cars and trucks are bringing huge changes to the auto industry, and drones are disrupting everything from emergency response to conservation, autonomous ships are becoming the next major transportation innovation. A number of startups and governments are piloting “unmanned marine vehicles” or crewless cargo boats, with the potential to disrupt the $334B shipping industry. Rolls-Royce already demonstrated the world’s first remotely operated commercial vessel earlier this year, and the US military is testing an experimental, autonomous warship called the Sea Hunter. Fully autonomous ships aren’t yet allowed in international waters. But with more and more companies (and governments) developing driverless vessels, the UN is considering policy changes that would allow unmanned boats to crisscross oceans, signaling a major sea-change to the global rules governing transport. That means “crewless cruising” by cargo vessels could take over the shipping industry sooner than you think. Already, there is a “ghost ship” that is expected to be ferrying cargo for commercial use as soon as 2020. The benefits of crewless cargo ships could be significant. A boat with no crew has no need for sleeping quarters, kitchens, or bathrooms, and can devote more of that space to products for transport; crewless shipping boats also don’t incur the costs associated with keeping people at sea for long stretches. Autonomous ships will not only enhance global shipping capacity (lowering transport costs and fuel consumption in the process), they can also potentially lead to safer seas: Human error accounts for over 60% of shipping accidents, according to EU data. Using vast networks of connected data sensors (and many of the same technological systems found in driverless cars and aerial drones), autonomous boats will share data and communicate amongst one another to navigate the high seas unmanned. These crewless vessels will either be operated remotely, like drones (via human control and technical monitoring on land) or self-drive autonomously, like driverless cars (via programmed mapping and artificial intelligence, without any human intervention). Boats of both kind are right around the corner. Oskar Levander, Rolls-Royce’s VP of Marine Innovation, made the above comments when the company announced its “Advanced Autonomous Waterborne Applications Initiative” (AAWA) last year. Rolls-Royce’s autonomous-vessel operation is among the most advanced in the space. Rolls-Royce has worked extensively in the shipping sector for decades, but launched the AAWA project as part of a broad vision to make better use of “ship intelligence” – aka the data from ships’ vast networks of systems and sensors. 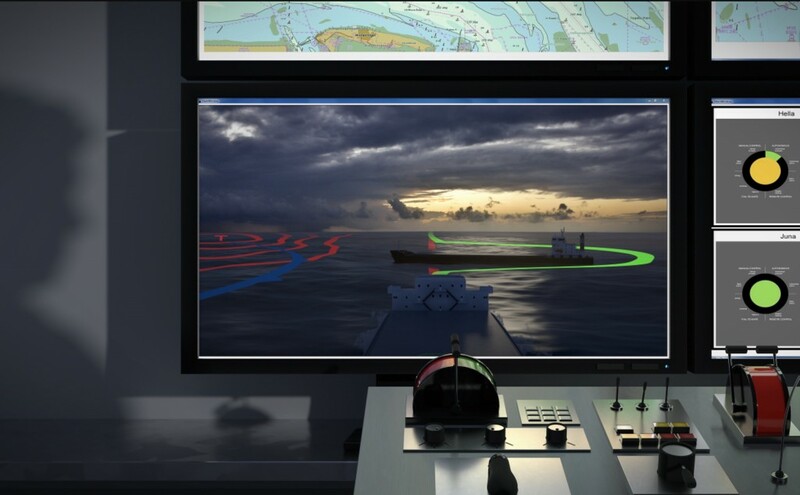 As part of that vision, Rolls-Royce intends to use a land-based control center (staffed with a small crew of 7 to 14 people) to monitor and control a fleet of remote-controlled and autonomous seafaring vessels around the world. 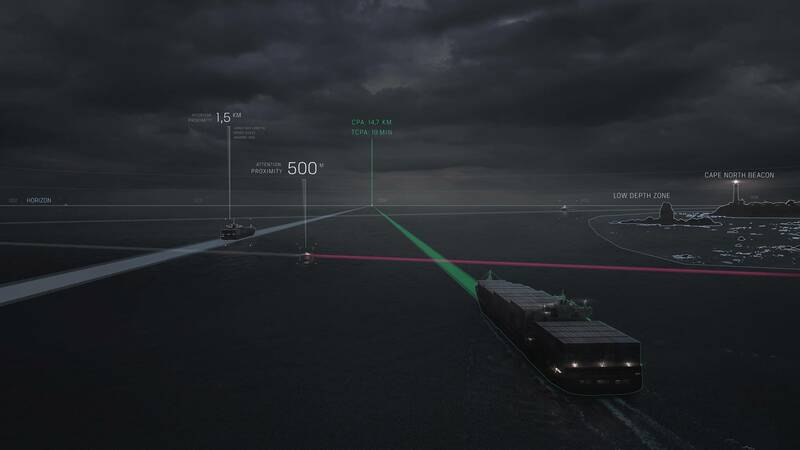 It is also working with Google to develop more robust “intelligent awareness systems” for both existing vessels and the autonomous ships of the future. The company has already taken its efforts well beyond the virtual realm. Rolls-Royce did a ghost-ship demo in June 2017 in which an 28-meter vessel berthed itself, undocked, turned 360°, and piloted itself to back to the starting point before docking again — all via remote control, on land. As part of its AAWA project, the British automaker has also studied the safety, cybersecurity, and liability issues facing autonomous ships. Several of Japan’s largest shipping outfits (including Mitsui OSK Lines, Nippon Yusen, and others) have reportedly joined forces to develop a fleet of 250 remote-controlled cargo ships that could be launched by 2025. 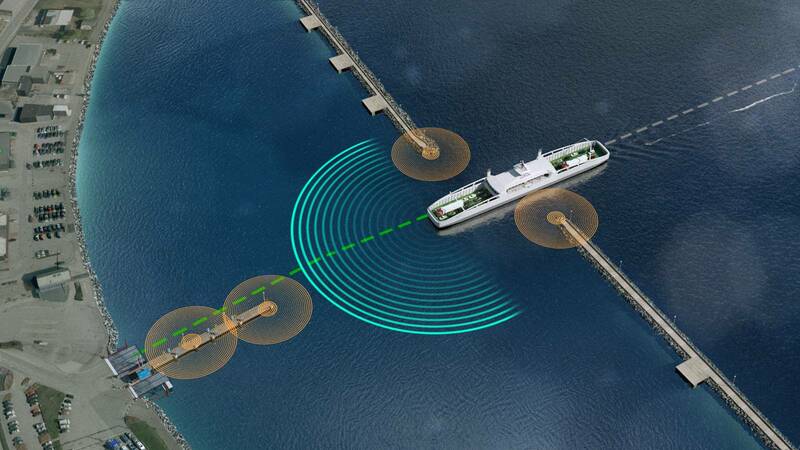 The Japanese government is supporting their initiative, backing research into data transmission efforts and standards around autonomous vessels. 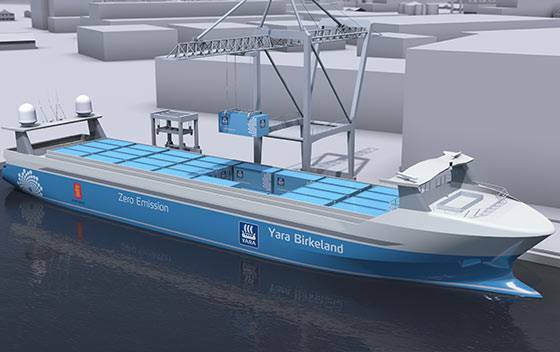 Kongsberg, a Norwegian technology company, is developing the YARA Birkeland – which will be the world’s first fully electric and autonomous container ship. To comply with international maritime law, the YARA Birkeland will operate close to the Norweigan shore when it begins sailing in 2020, ferrying fertilizers between three Norwegian ports. While not focused on shipping, some startups are creating driverless vessels that also stay close to the shore: RanMarine operates a Roomba-like unmanned marine vehicle used to collect waste in ports and harbors; Orobotix makes sub-sea drones to help operators automate underwater inspection tasks. While much activity is happening on the development side, autonomous cargo ships still won’t have a major impact on the shipping industry until they can cross international waters, since the maritime shipping industry is largely focused on transporting goods between distant countries. The UN’s International Maritime Organisation (IMO) – which regulates shipping – began discussions in June 2017 that could allow unmanned ships to operate across oceans; IMO will continue to consider changing the “International Convention for the Safety of Life at Sea” (SOLAS) to allow ships with no captain or crew to travel between countries. Sovereign entities will likely ensure the rules of the sea are rewritten sooner rather than later: The European Union has put $4B into its MUNIN project (short for Maritime Unmanned Navigation through Intelligence in Networks); and DARPA is currently testing its autonomous-submarine the Sea Hunter (which it developed in response to “advancements” China and Russia are making in the space, according to officials). The 132-foot Sea Hunter is powered by diesel engines and is designed to operate autonomously, for months at a time, without a crew or any human control. Watch the demonstrations of the Sea Hunter below. DARPA’s Anti-Submarine Warfare (ASW) Continuous Trail Unmanned Vessel (ACTUV) program has designed, developed and constructed an entirely new class of ocean-going vessel—one intended to traverse thousands of kilometers over the open seas for months at a time, all without a single crew member aboard. The ACTUV technology demonstration vessel was recently transferred to water at its construction site in Portland, Ore., and conducted speed tests in which it reached a top speed of 27 knots (31 mph/50 kph). Do the benefits outweigh the risks? Advocates for autonomous cargo boats tout a number of potential benefits to these vessels. 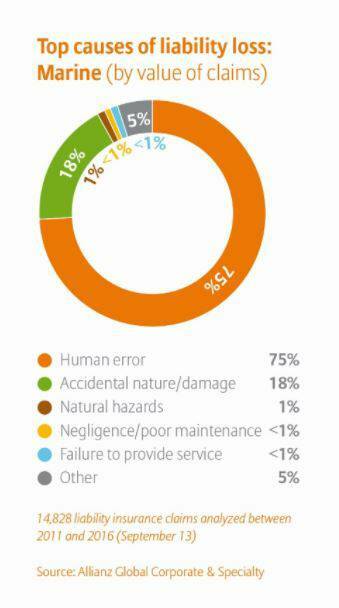 Safety: Insurance data shows that people cause the majority of ship accidents and resulting damages; in 2016, at least 75% of insured marine losses arose from human error, according to the most recent AGCS Global Claims Review. Costs: Paying a crew can account for almost half of a cargo ship’s expenses. And with no requirement for manned spaces and accommodation, driverless vessels are expected to be cheaper to build with lower operating costs. Capacity: Physical spaces formerly reserved for people are utilized to increase cargo load, potentially making import-export processes faster and more efficient around the world. Piracy Risk: Uncrewed ships can be built so that they are difficult for pirates to board. Even if pirates got aboard, access to controls could be disabled remotely, and authorities could be rapidly notified (via data) to intervene. And with no crew to hold hostage for ransom, the incentive for piracy is fairly low anyway. Data Use: Enhanced ship intelligence cultivated by data-smart, sensor-equipped cargo ships will be used to map more efficient shipping routes, inform fuel-use modeling, and better understand geological activities and climate fluctuations. But while the benefits may seem obvious, there are significant concerns around just how much money these ships could save, and whether “roboships” should really be considered safer than existing vessels. Such concerns play into the regulatory considerations: The existing International Regulations for Preventing Collisions at Sea, for example, were written with conventional crewed ships in mind, and provide no absolute “right of way” for vessels. Rule 2, in particular, requires real-time human judgment to avoid immediate danger. Given the liabilities at stake, modifying long-held marine standards — and removing the role of humans from them entirely — is no small concern to maritime insurers. Consider the safety issue: Even though 62% of shipping accidents occur thanks to human error, an estimated 1.65 million skilled workers labor on international merchant ships today. And as Rule 2 shows, their roles aboard those ships are not seen as insignificant. Many believe that removing experienced crew from ships means that any accidents that do occur could be far more severe (since personnel would not be on-hand to mitigate ship damage or intervene in any resulting environmental disasters). Ultimately, this creates a number of questions for maritime insurers. And how insurers support or resist the commercialization of these vessels, and potentially price policies, will also have an impact on how the industry develops. Will data be the real advantage? A recent study by researchers at the Fraunhofer Center for Maritime Logistics and Services weighed the overall potential for driver-less ships to reap returns: In an exploratory cost-comparison between an autonomous vessel and a conventional bulk carrier, researchers found that there are indeed savings to be made – mainly around crew pay, accommodations, and utilities. But new costs factor into play, too. To deploy driver-less cargo ships, companies will need to equip their fleets with advanced sensors and control systems. Recruiting a land-based workforce (and expensive new operations centers) will also absorb resources and offset savings. The expenses add up: Even factoring in the much-improved fuel efficiency of greener autonomous boats, the Fraunhofer Center study found that an unmanned bulk cargo carrier may be able to reduce the cost of carrying freight by only around 3.4%. But for any of the world’s massive global freight or logistics companies (such as UPS, DHL, or Amazon) a 3.4% reduction in costs represents millions in recouped revenue, which may be incentive enough to embrace the technology. And even though there are over 1 million ship-bound jobs at stake, at least a portion of the job losses will be offset by job growth in new areas. Just as driverless cars will disrupt industries well beyond auto – ranging from parking garages to public transit – driverless ships will likewise upend dozens of shipping-related sectors and standards, leading to new work at ports and manufacturing centers. And the tech may create jobs in other areas, too, thanks to data. With Rolls-Royce and Google, for example, already collaborating to use marine data sets in various AI and machine learning models, there’s no limit to how marine intelligence could reshape the transportation sector at large. “Autonomous shipping is the future of the maritime industry,” says Mikael Makinen, President of Rolls-Royce Marine. Never before have humans journeyed to the Antarctic deep sea.